Ringworm is a common infection of the skin and nails caused by fungus. 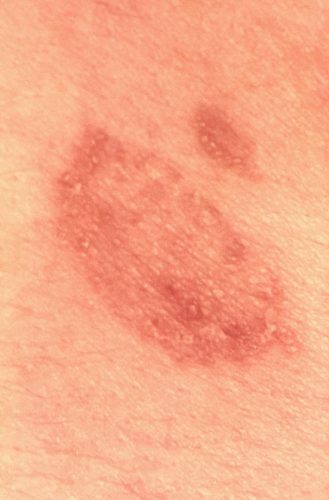 It is called “ringworm” because it can cause a red, itchy, circular rash that looks like a ring. Ringworm is also called “tinea.” The different types of ringworm are usually named for where they are on the body. There are about 40 different species of fungi that can cause ringworm. General symptoms of ringworm are itchy skin, ring-shaped rash, red, scaly, cracked skin, and hair loss. Symptoms typically begin 4 to 14 days after the skin comes in contact with the fungi that cause ringworm. Feet (athlete’s foot): red, swollen, peeling, itchy skin between the toes (especially between the pinky toe and the toe next to it). The soles and heels can also have symptoms. 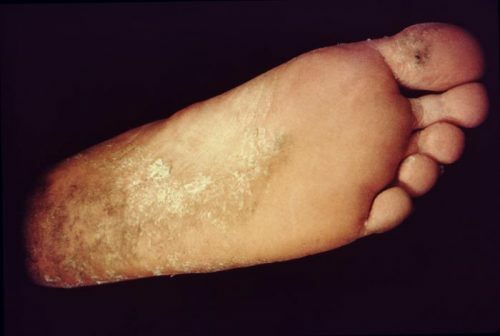 The skin on the feet can blister in severe cases. Scalp: scaly, itchy, red circular bald spot on the scalp. 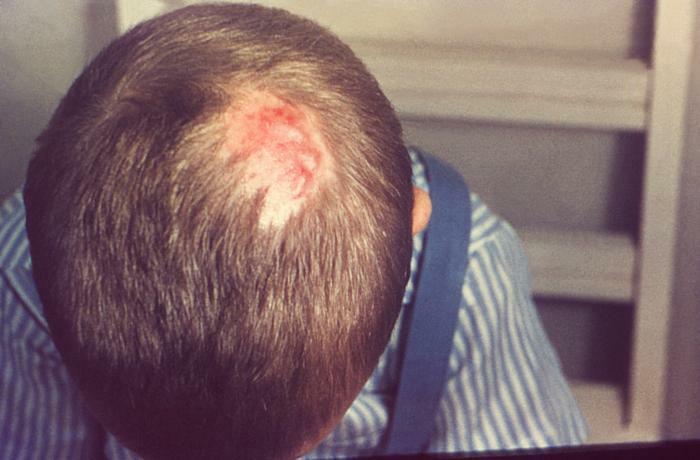 The bald spot can grow in size and if the infection spreads, multiple spots can develop. Ringworm on the scalp is more common in children than adults. Beard: scaly, itchy, red spots on the cheeks, chin and upper neck. The spots may become crusted over or fill with pus and the affected hair might fall out. From another person who has ringworm. Direct contact to an infected person, and contact with clothing, towels, combs, or other personal items from the infected person. From an animal that has ringworm. Contact with an infected animal, including dogs and cats, especially kittens and puppies, cows, goats, pigs, and horses. Your doctor can diagnose ringworm by looking at your skin and asking about symptoms. They may take a small skin scraping to look at under a microscope or send it to a laboratory for a fungal culture. If your symptoms get worse or don’t go away, contact your doctor. There is no immunity to ringworm. People with weakened immune systems may be more at risk for infection and might have problems fighting off the infection. There are no statistics on how many people have been infected with ringworm in Hawaii. Children under 12 years seem to get ringworm of the scalp more often than adults. For athletes, shower immediately after practice or a game and keep all your equipment and uniforms clean. Don’t share equipment with other players.